Jerrica & Sheena Singh prep for Zardozi’s spring cover shoot in Cabbagetown, Toronto on February 8, 2015. As soft white snowflakes fell from the sky, twin sisters and best friends Jerrica and Sheena braved the cold to travel into a floral nirvana curated by the talented bloom stylist Becky DeOliveira of Toronto’s Blush & Bloom. Inspired by strong women of the past, the floral crown was an ornamental piece, which often celebrated one’s status, love and fertility. Worn today by the romantic and free and most commonly seen at music festivals and on brides, floral accessories have made a strategic comeback, spotted on some of the most famous of celebrities. 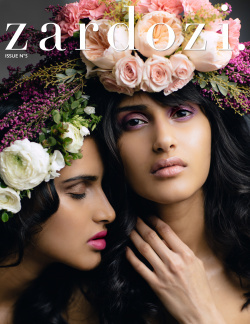 This month’s cover, shot by Karolina Kuras, focuses on floral art and the natural beauty of South Asian women. Embrace the elegance with In Bloom.